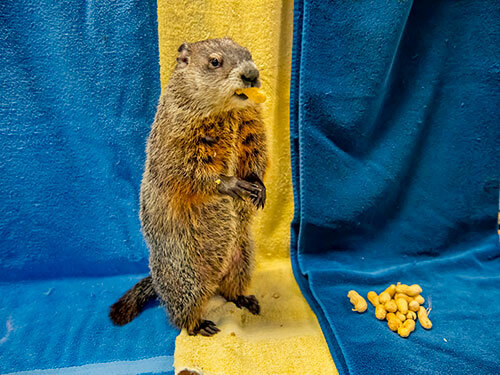 Last year, the Zoo’s Groundhog Day ceremony took a furry twist as polar bear Snow Lilly stepped in to make the expert weather forecast, as the animal collection did not include a resident woodchuck (the Zoo’s groundhog, Wynter, passed away in 2017 at the age of 9). 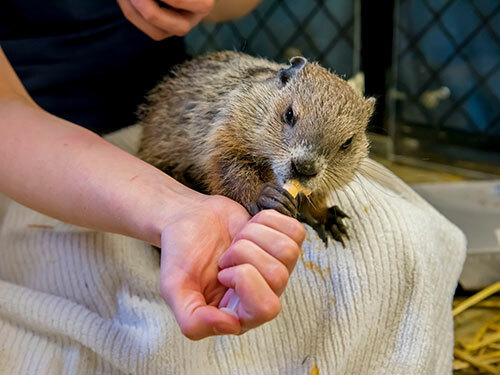 Fast forward to 2019…on February 2 at 10:30 a.m., the Zoo is excited to introduce its new groundhog, a 10-month-old male named Gordy! According to tradition, if it’s a sunny day and Gordy sees his shadow, he’ll return to his burrow for six more weeks of winter, but if he does not see a shadow…expect an early spring! New this year! The celebration includes a free raffle in which visitors can “Guess Gordy’s Weight.” The winning guess will receive a much sought-after groundhog-themed headband, slippers and groundhog plush toy. Excited fans can also prepare for the big day by downloading the “Gordy the Groundhog Coloring Sheet”. 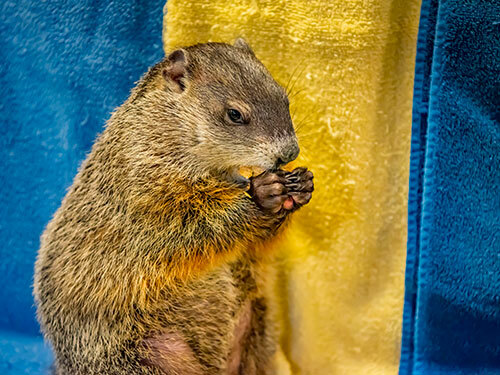 Color the sheet, bring it to the Zoo on Groundhog Day, and you’ll be entered to win a special Groundhog Prize Package! Gordy arrived at the Zoo last May, and in September, made his first public appearance as part of the Animal Encounter talks in the Northwestern Mutual Family Farm. Gordy was born in Indiana, and hand-raised. The fact he was hand-reared makes it easier for zookeepers to train him for keeper talks and possible interactions with visitors. Keepers comment Gordy has a “goofy and friendly personality,” traits the animal staff hoped for when he was acquired by the Zoo. Groundhogs, also known as woodchucks, are one of the largest members of the ground squirrel family. They’re good swimmers and can climb trees. In the wild, they eat grasses, plants, fruits and tree bark. In warm seasons, a groundhog can eat more than one pound of vegetation in one feeding. 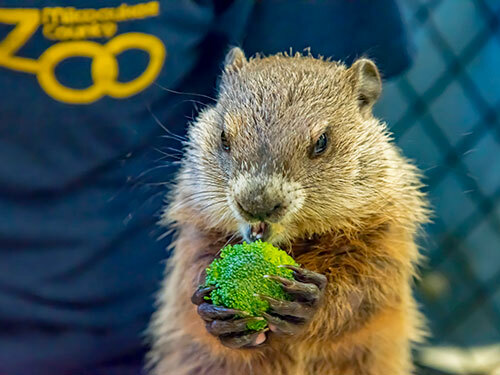 On Saturday, February 2, visitors are invited to celebrate Groundhog Day at the Milwaukee County Zoo and watch as Gordy makes his furry forecast debut. Activities take place at 10:30 a.m., in the Northwestern Mutual Family Farm, as Gordy ventures from his burrow. Also on February 2, the Zoo hosts Family Free Day sponsored by North Shore Bank. All Zoo visitors receive FREE admission; the parking and regular concessions and attractions fees apply. For more information, please call the Zoo’s Marketing and Communications Department at 414.256.5466.